When Steve Bruce brings his Hull City side to the John Smith’s Stadium on Saturday, it will be the first time he has managed a side in front of the Huddersfield faithful since he was sacked as manager in October 2000. 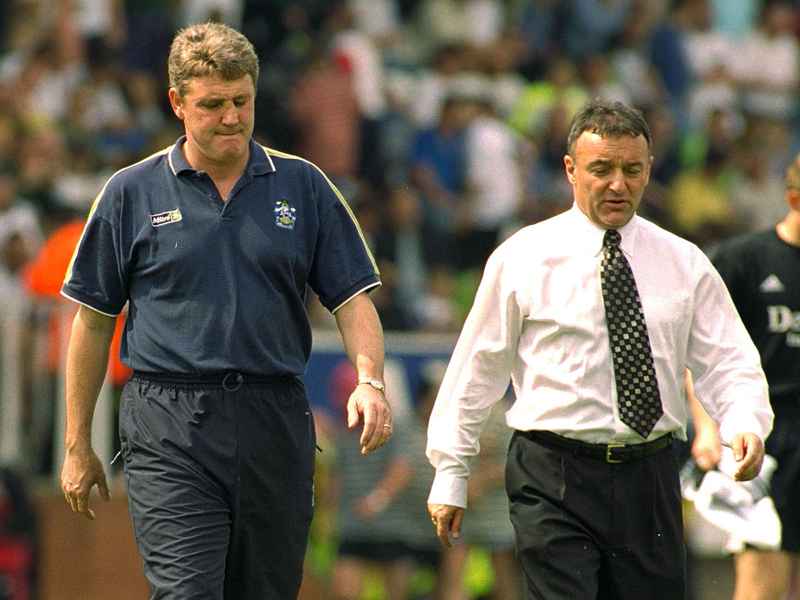 At the time of Bruce’s sacking Town had recorded just 1 win in their opening 19 league games of the 2000-01 season. This nightmare start ultimately did irreparable damage to Town’s season as they eventually fell through the relegation trapdoor on the last day of the season. Though Town have had plenty of inept managers both before and after Bruce – Mick Wadsworth, Andy Ritchie and Stan Ternent immediately spring to mind – it is Bruce who is still held in the lowest regard by the majority of Town fans. Perhaps part of the reason for Bruce’s unpopularity is the fact that things were so encouraging at the start of his tenure. Backed by the millions of local electronics tycoon Barry Rubery, Bruce established a team that was challenging for at least a play-off spot for the vast majority of the season. High profile signings included Ken Monkou, Clyde Wjinhard and Dean Gorre and for the first few months of the season Bruce had the team playing quality, attractive football. To a younger generation of Town fans this remains the best football produced by a Town team in their lifetime. A 7-1 home win against Crystal Palace and a 3-1 victory away at Nottingham Forest particularly stick in the memory. A run of 9 wins in 10 games in the run up to Christmas saw Town go top of the table and promotion to the Premier League looked a genuine possibility at the turn of the year. The fact that Town were playing so well and challenging for promotion, however, only served to increase the disappointment when Town missed out on the play-offs and highlight just how spectacular Town’s fall from grace would be over the next 18 months. 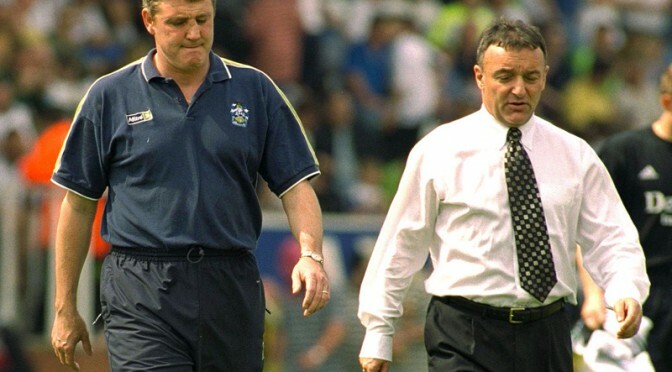 A torrid start to 2000 which saw Town win just 2 of the first 12 games of the calendar year, and the now infamous sale of star striker Marcus Stewart to promotion rivals Ipswich, saw Bruce’s popularity plummet. However, it was Bruce’s decision to accept the BBC’s offer to cover Manchester United’s ill-fated World Club Cup campaign that particularly rankled Town fans. The decision to abandon a team struggling for form, just at the time when strong management was most needed, remains a baffling and frankly unacceptable decision on Bruce’s part. Though Town continued to occupy a top-six spot until the final day of the season, the free-flowing, attractive football never really returned after Bruce left for Brazil. In many ways it was this trip to Brazil that marked the beginning of the end of Bruce’s reign. It is fair to say that Rubery was naïve – dangerously so – to the consequences his financial backing would have on the club. But it is also true that Bruce could have spent the significant funds available to him more wisely. That is to say that it is not Bruce’s fault that he spent the funds – if the owner makes funds available then you are well within your rights to spend them – but Bruce can be blamed for ultimately spending the funds on players who were not good enough. The most notable example of this was the signing of George Donis. Despite only playing 20 games for the club, Donis would eventually cost Town nearly £1 million in various fees and wages before his contract was terminated by mutual consent so he could return to his native Greece. Bruce’s legacy in the transfer market would ultimately be to saddle Town with a series of overpaid and injury prone players. Ken Monkou, Clyde Wjinhard and Chris Hay all made less than 10 starts for Town the year they were relegated and it is for signing expensive flops, like Donis, rather than the likes of Gorre, Lucketti and Irons, that Bruce is most remembered. Bruce’s reign was undoubtedly one of unfulfilled potential and ‘what ifs.’ What if, for instance, Town had completed the signing of John Terry for £750,000 and what if Marcus Stewart had not been sold to Ipswich? Though I am convinced Town would have reached the play-offs had Stewart remained at the club, football simply does not allow for ‘what ifs’ and the cold fact remains that Town, under Bruce’s stewardship, blew a glorious chance to reach at least the play-offs in the 1999-2000 season. Though the team he assembled remains the best that a number of Town fans have ever seen, and provided Town with their joint highest final league position since the early 1970’s, it could – and probably should – have achieved so much more. Had Bruce been more savvy in the transfer market, and had he not abandoned the club when the team was struggling just after Christmas, then he could have built something special at Huddersfield. As it was, Bruce is remembered for turning his back on the club when the going got tough and the money dried up. It is this unfulfilled potential that pains Town fans to this day. Town could easily have begun the 2000-01 season in the Premier League yet in reality they were to begin a season of heartbreak, disappointment and relegation. By the time he was sacked, Bruce had run out of ideas and you would barely believe the team that appeared at Grimsby, in Bruce’s final game, belonged to the same manager as the one who had led Town to the Division 1 summit the previous season. Though Bruce has not yet managed a side at the John Smiths Stadium since his departure, the reception his son Alex got whilst on loan at Sheffield Wednesday was proof of just how much anger is still felt towards Bruce among Town fans. Whilst on loan at Sheffield Wednesday in 2005, Bruce junior had his every touch booed and was subject to all sorts of abuse from the crowd before he eventually snapped and retaliated with a two-footed tackle on then Town player Adnan Ahmed, which resulted in a straight red card. Rightly or wrongly, Bruce will forever be associated with the capitulation of the 1999-2000 season and the dark days of relegation, administration, and near liquidation that followed. For these reasons, although Bruce has proved himself a relatively successful manager at other clubs, he will undoubtedly receive a hostile reception from the majority of Town fans when he walks out of the tunnel at the John Smiths Stadium on Saturday. When James Vaughan signed on a season-long loan deal for Huddersfield Town back in August, few people realised just how important he would become to Town’s season. Question marks over his long-term fitness and his modest goalscoring record (17 goals in 93 league appearances before joining Town) meant some fans were skeptical as to how much of a contribution he could make this season. However, a relative absence of injuries and a goalscoring average of better than 1 in 3 at the time of writing have left few Town fans in any doubt that Vaughan is a player of real quality and that every effort must be made to try and secure his permanent signing. Vaughan is Town’s leading scorer this season with 9 goals but Vaughan should not be judged on his goalscoring record alone. Despite the fact he is only on loan, he has displayed genuine passion, determination and character – attributes which have endeared him to the Town faithful during his brief spell at the club so far. Heavy defeats, such as the thrashings Town received against Leicester and Nottingham Forest, clearly hit Vaughan hard and it is refreshing to see a loan player show such genuine commitment to the cause. Vaughan’s phenomenal work rate and determination are valuable assets to the team in terms of both chance creation and defending from the front. If anything it could be said that Vaughan works too hard. At times he arguably pushes himself too far and this has occasionally resulted in injuries and needless bookings – 11 bookings in 29 games is staggering for a centre-forward. Nevertheless, as Vaughan’s game is based around robust hard work, shirking challenges or holding back in any way to avoid bookings or injuries would take away a large part of what makes Vaughan such an effective player. To demonstrate just how important Vaughan has been to Town this season, it is worth looking at Town’s win ratio with and without Vaughan in the league this season. This season, Vaughan has started 23 games. In these games Town have accumulated 34 points – 9 wins, 7 draws and 7 defeats. This means Town have gained 1.48 points for each game Vaughan has started. To put this into context, if this points to game ratio was maintained over a season then it would give Town 68 points. In contrast, in the 15 games Vaughan has not started, Town have picked up just 13 points – 3 wins, 4 draws and 8 defeats. This is a points to game ratio of just 0.87 points per game and this would give Town only 40 points over the course of a season. Obviously it is not as simple as this – even if Vaughan had started every game this year it is highly unlikely Town would have acquired 68 points – but it does go some way towards proving just how vital Vaughan has been to Town’s season. As Vaughan has clearly proved himself in terms of ability, and as his injury record has been generally good, Huddersfield should be doing everything in their power to try and secure a permanent deal for Vaughan. But can a deal realistically be done? The first thing that has to be considered is whether Norwich would be willing to sell. With Norwich’s Premier League survival all but guaranteed, it seems that Vaughan will find himself surplus to requirements at Carrow Road next season. As well as already having Grant Holt and Simeon Jackson on the books, Norwich have brought in Luciano Becchio and Kei Kamara since Vaughan joined Town in August. With the impending arrival of Dutch international Ricky van Wolfswinkel, Vaughan appears to be well down the pecking order in a team that often plays with just one out and out striker. In this regard it seems that Norwich will probably be willing to listen to offers if a reasonable bid comes in. The second thing, therefore, that must be contemplated is whether Huddersfield can afford to sign Vaughan. Vaughan would likely command a fee in the region of 1 to 1.5 million pounds, which is a significant fee for a lower end Championship side. However, the sale of Jordan Rhodes last summer means that Town should be able to spend some money (within reason) in the transfer market this summer. Though Chairman Dean Hoyle has spoken of the need to make Town self-sufficient and to further reduce the club’s wage bill, the fact is Town simply cannot afford to pass up on the chance to sign Vaughan. When the loan deals of Vaughan, Theo Robinson and Jermaine Beckford expire in the summer, Town could have only one striker – the untested Jimmy Spencer – on their books. Alan Lee’s contract almost certainly won’t be renewed whilst Lee Novak’s future at the club is seemingly undecided. Given the need to bolster Town’s attacking options, therefore, and the potential availability of Vaughan, Town would be mad to pass up the opportunity to sign Vaughan permanently if he was available at a reasonable price. The only problem that leaves is whether Vaughan himself would be interested in signing permanently. Vaughan is not the type of player who will just be happy to sit on the bench or fester in the reserves at Norwich, and in the aftermath of the Leeds game Vaughan admitted he would be happy to discuss terms if a fee could be agreed. Vaughan would likely become one of the clubs highest earners if he were to join but given the fact that a number of the existing high-earners, such as Alan Lee, are out of contract in the summer, Town should be able to offer Vaughan a decent contract and still have money left over to bring in some more reinforcements. However, although Vaughan is clearly enjoying his loan spell at the club immensely, it remains to be seen whether Vaughan would be prepared to take what would probably be a sizable wage cut in exchange for regular first team football. Also, as Vaughan has proved himself a highly capable Championship striker whilst playing for a struggling team, there is a chance that Town could be gazumped to his signing if a bigger club comes in with an offer over the summer. For periods this season Vaughan has simply looked too good for a Huddersfield team that has, at times, struggled to adapt to the demands of the Championship and at points he has almost single handedly carried the responsibility of scoring Town’s goals this season. With this in mind it would be hard to begrudge Vaughan if he decided to take up the opportunity to play for a team with greater aspirations and more financial clout if the offer was forthcoming. Nevertheless if Huddersfield do maintain Championship status, they must do everything in their power to attempt to bring Vaughan in permanently. Though Vaughan would not be cheap, he has proved himself a player of real quality and few players have made as much of an impact during a loan spell for Town as Vaughan has. The emphasis must be on quality rather than quantity this summer and Town would be much better off signing a player of Vaughan’s caliber than signing 2 or 3 ‘squad players.’ Some of the money from the Jordan Rhodes sale must be used over the summer if Town are to be at all competitive next season and if a deal could be done for £1-1.5 million then that would surely be money well spent by Town. If Town are to have any realistic chance of making Vaughan’s loan move permanent, then staying in the Championship is vital. Town’s Championship status next season is far from certain and any chances of signing Vaughan hinge on survival. Vaughan would not want to sign for a team in League One, nor would a League One side be able to afford his transfer fee or wages. A deal for Vaughan, therefore, is by no means guaranteed and it would be foolish to think that Vaughan will certainly sign for Town – even if Championship status is secured – but the powers that be must do everything they can to try and sign him. If a team comes in with a better offer or if Norwich are unwilling to do business then that is fair enough. However, it would be criminal if Town made no attempt to permanently sign a player with such high workrate, determination, passion and, most of all, quality. 21st-century football: Necessary progression or corporate enterprise? Football. It’s still very much the order of the day. Walk into any pub in an evening and listen to the conversations. A stark majority will be about the beautiful game. Should Wenger be sacked? Are Barcelona on the decline? Can Leeds still get promoted (for the more Yorkshire-orientated establishments!)? Football fills lives, fills Saturday afternoons, provides talking points, enables people to give their opinions to like-minded fanatics. But football has changed. I’m only young myself, but can still see the change that can be seen in the last ten years alone. Ten years ago, it was possible for a relatively unknown side to make the huge jump from obscurity to the top flight on a limited budget. That’s becoming increasingly rare. It was also possible for a side in the top division to reach the higher echelons of the same league by blooding youth and creating a team spirit and camaraderie – indeed, Leeds United in the late 1990s and early 2000s was a prime example. That, also, is becoming rarer. Nowadays it seems you need megabucks to even consider reaching a European competition, and even then it’s no longer guaranteed. The more prominent oligarchs and sheikhs become in the English game, the harder it is for the previously wealthy teams to compete, leading to more and more corporate gain for the men at the top and an ever-widening gap between those at the top and those languishing in the lower divisions. Manchester City and Chelsea are two startlingly obvious recent examples. When Roman Abramovich bought Chelsea in June 2003, they were a solid Premier League side, generally finishing in and around the top four, albeit with £80m of debt. By May 2004 Chelsea had finished 2nd, constituting their greatest finish in forty-nine years, paid off their debt, and gone on a £100m spending spree. But an even more shocking example is that of Manchester City. Since being bought by Sheikh Mansour in 2008, they have spent over £200m on players alone, essentially buying the Premier League title in 2012 and FA Cup in 2011. But even worse than clubs paying their way to success and pricing smaller clubs out of the game is the effect that this commercial development has had on the average football fan. Virtually priced out of the game and becoming more disillusioned by the day, your average fan – the likes of which essentially founded the sport originally – has been thrown to the bottom of football’s hierarchical scrapheap as it becomes a commercial enterprise rather than the sport we used to know and love. A prime example of fans being priced out is the £62 ticket to watch an Arsenal match recently. Add in a programme, food and drink, transport, and it will undoubtedly add up to around £100. How can clubs expect a fan to pay that much per game? And it’s clear that there’s a widespread nonchalance from clubs and owners. Provided they get the subscribers, Sky don’t care. Provided they get the prawn-sandwich brigade and the ludicrous sponsorship, the FA and Premier League don’t care. Provided they get the gate receipts and a money-making plaything, neither do the wealthy owners and investors. What’s the answer? In all honesty, I don’t think there is one. While there’s money to be made for the powers that be, nothing will change and football will continue on its inevitable downward spiral until it becomes a sport for the elite. But if things are to change, the fans need a voice. German clubs have a 50% fan-ownership basis, which is a very good move if it encourages more fans to get involved with their teams. After all, clichéd though it may be, the fans are the lifeblood and the vitality of a football club. Without them, a club would simply cease to exist. This is a point that the executives often forget.